Born August 1950 in Beirut, Lebanon. 1978-1980 Part-time teacher at the American University of Beirut, Design studios and lectures. 1977-1978 Junior architect, Group of consulting architects to the Beirut Municipal Authority. 1976-1977 Junior architect, Dar al Handassah, Paris branch. Thesis subject: A conceptual framework for the comparative study of environmental administration. 1974-1976 Department of Urban Planning, Columbia University, N.Y.
July 2007 Women Who Build (La Mujer Construye) "The Underrated Role of Women Architects" Utrecht. May 2007 Presentation of our work in the frame of the FEA Distinguished Alumna Award. AUB, Beirut. 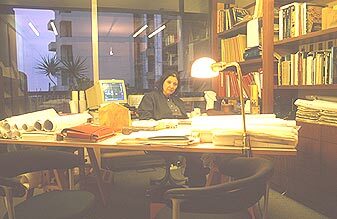 Dec. 2002 Women Who Build (La Mujer Construye) "The Link between Tradition and Modernity"
May 2002 Italian Trade Commission (ICE) "Perceptions Sensorielles dans L'Architecture"
Seminar on the Science and Technology and Conservation of the World Heritage. Intervention on the " Vernacular Residential architecture and New Housing Tendencies in Lebanon. " Panel Discussion on Architectures and reconstruction in Lebanon Panellist. May 1992 Urban Research Institute. Seminar on the reconstruction of Beirut. Intervention on "The Heritage and Physical Planning of Beirut Central District". Co-lecturer : Fouad El- Khouri. Jun-Sept. 12 DECO MAGAZINE "L'Authentique Charme de Bahreïn"
Sept- Dec. 11 DECO MAGAZINE "Un Amour de Tradition"
Autumn 2010-11 2A - Architecture and Art Women's Voices in Architecture and Design in the Middle-East "Dar al Mamluka Hotel, Damascus"
Sept- Dec. 10 DECO MAGAZINE "Un Cube Bourré de Charmes"
Mar-Jun . 09 DECO MAGAZINE "Rustique Montagne"
Jun-Sept . 08 DECO MAGAZINE "L'Enjeu des Traditions "
Oct-Dec . 06 DECO MAGAZINE (Lebanon) "La Maison de toutes les Envies"
June-Aug . 06 HARMONIES (Lebanon) "Orange et Bleu"
Sept- Dec . 04 DECO MAGAZINE (Lebanon) "Nancy's Farm à Jiyé"
Sept-Nov . 04 HARMONIES (Lebanon) "Un Duplex au Mieux de sa Forme"
Mar-May 03 HARMONIES (Lebanon) "Minimalisme Expressif"
Dec . 02 - Feb . 03 HARMONIES (Lebanon) "La Politique du Cube"
Jun- Sept . 01 DECO MAGAZINE (Lebanon) "Le Langage des Archetypes"